Just like at the Movies – Popcorn Ain’t Cheap! I recently had to deal with an older home with popcorn ceilings that we assumed had asbestos in it. 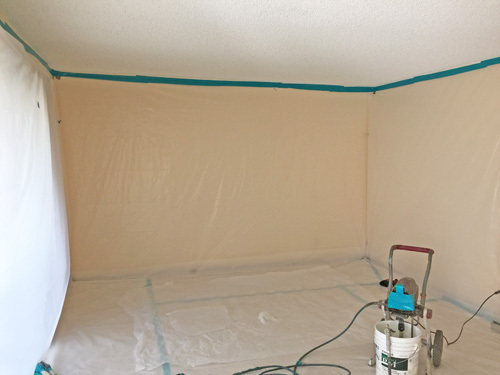 The owners asked me for a quote to have the popcorn ceiling removed and the area retextured. What I discovered was that it cost approximately $4 per square foot to remove the popcorn material. The removal is expensive because there are permits involved and high costs for disposing of the hazardous material. Then it could cost $3 to $4 per square foot to texture the ceiling depending on whether you want a smooth or rough finish. Smooth finishes are more expensive because they required more coats of mud. So, to do it correctly, you are looking at $7 – $8 per square foot to remove the popcorn and retexture. Put another way, for a 2 bedroom Brittan Heights condo (they are 1,040 sf) that’s approximately $8,000. I just recently heard from someone who received at quote for about this exact amount for a 2/2 condo at the complex – this is a photo of the actual Brittan Heights unit as they were getting ready to start stripping the ceiling. Not cheap, but for some folks they just can’t stand looking at it. However, it could be worse, the house I was getting a quote for had gold sparkles in its popcorn ceiling. As always, don’t forgo getting permission from the HOA for the work.